Ericom® PowerTerm® WebConnect for Microsoft Windows Server 2008 Hyper–V — Totally FREE for up to 500 users ! PowerTerm WebConnect for Hyper-V provides centrally managed access to virtual desktops running on Windows Server 2008 Hyper-V. As an enhanced connection broker, PowerTerm WebConnect simplifies and accelerates deployments of Hyper-V virtual desktops across the enterprise. Together, Ericom's and Microsoft's desktop virtualization solution helps create a secure, sophisticated and centrally managed desktop virtualization platform - ideal for enterprises seeking to reduce the cost and complexity of traditional desktop management. For a limited time only, you can leverage the benefits of PowerTerm WebConnect for Hyper-V For Free. Get on the path toward greater productivity and lower desktop management costs. Enhance overall IT operational flexibility, while meeting space and power-saving goals. download PowerTerm WebConnect for Hyper-V for FREE. 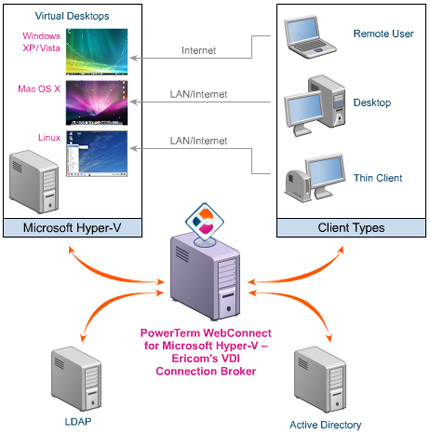 Ericom's VDI connection broker, supporting Hyper-V. Administer virtual desktops from a centralized location and reduce the cost and complexity of virtual desktop deployment and maintenance. Increases development and test efficiency by reducing the amount of time it takes to set up hardware and software and reproduce test environments. Improves server availability without using as many physical computers as would be needed in a failover configuration that uses only physical computers. Increases or reduces server resources in response to changes in demand. PowerTerm WebConnect for Microsoft Hyper-V gives enterprises the opportunity to lower overall operating costs and TCO while enhancing the manageability and flexibility of the IT environment, creating an environment-friendly IT infrastructure and enhancing the user-experience. For a limited time only, download PowerTerm WebConnect for Hyper-V for FREE. 1 Ericom reserves the right to terminate this free offer at any time. The on-line FREE offer is for up to 500 free licenses; please contact us for quantities above 500. PowerTerm WebConnect products suit the full range of IT environments.